I was at a recent meeting of the Federal Geographic Data Committeee’s Coordination Group and Anne Castle, the Assistant Secretary for Water and Science in the Department of the Interior and the co-chair of the FGDC Steering Committee, was discussing the challenges of finding resources to support geospatial activity. The federal geospatial community is working with a reduced budget (for example, the FGDC recently announced the cancellation of their long-running CAP grant program for FY 2013 and 2014), but a chief concern of the participants was not just shrinking resources for geospatial activity, but the challenge of structuring funding in a way that facilitates and encourages cross-agency collaboration and long-term thinking. We in the stewardship community are no strangers to this problem, but there’s much we can learn from the experiences of the geospatial community. The geospatial community not only provides governance models for how we might go about our business, but they also are building tools we can tap into to help us tackle stewardship issues across organizations and generations. “The Geospatial Platform will offer access to a suite of geospatial assets including data, services, applications, and infrastructure that will be known as the geospatial Platform offering…The Geospatial Platform will support an operational environment, www.GeoPlatform.gov, where customers can discover, access, and use shared data, services, applications, and when appropriate, infrastructure assets.” – from Modernization Roadmap for the Geospatial Platform (PDF), pg. 10. The Platform builds upon existing federal interagency geospatial initiatives to share data, develop collaborative programs and establish standard national datasets. It is a significant effort that has become a chief focus of energy and attention across the federal geospatial data community. Early adoption provides participants with more dedicated technical support resources and reputational benefits. Of course, these potential benefits are offset by issues that the digital stewardship community must address before moving forward with any kind of engagement . 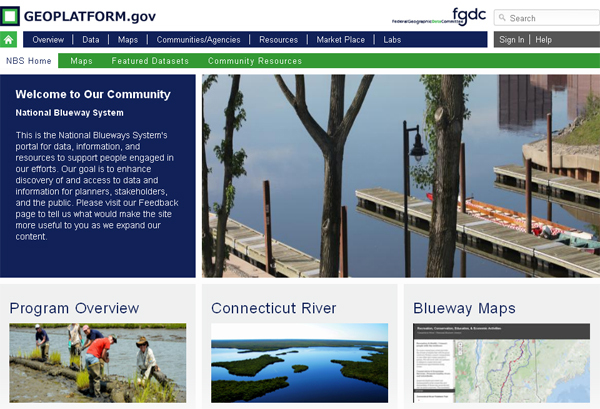 The National Blueway System Community Portal on the Geospatial Platform. First off, our community will need to clarify its purpose(s) for engaging with the Platform or similar activities (the academic-centric OpenGeoportal project has some similarities to the Platform and may offer another outlet for digital stewardship community participation). Do we see the Platform as a clearinghouse for information on geospatial preservation and stewardship, like geopreservation.org but embedded in another community? 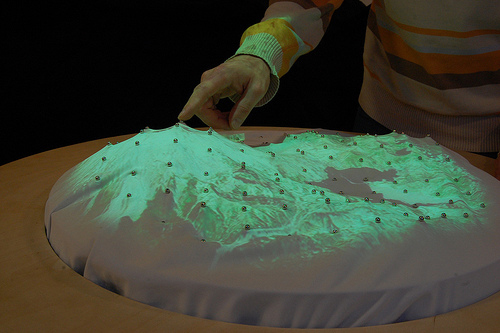 Or is it most useful as an access point to collections of historical digital geospatial data? Or both? Who will manage a “historical geodata community” on the Platform? Are there enough interested NDSA members to take on the management of a Platform community, or is it necessary to build a wider coalition of willing participants? Do activities like the Platform provide enough benefit to make the effort to utilize them as a central distribution point for historic digital data? With all of this in mind, what are your thoughts on engaging with the Platform and activities like it? How can we most effectively marshal our community resources, both within the NDSA and across the wider community, to take advantage of opportunities like this as they arise? This is a syndicated post. Read the original at The Signal: Digital Preservation 2013-09-11.